Democratic Transformation ad Development in Morocco. You are cordially invited to attend a Special Event for the Moroccan Community of UK meeting with Mr Aziz Rabah - Mayor of Kentira & Member of the General Secretariat of PJD in the Kingdom of Morocco on Saturday, 3rd March 2018 at 6pm. 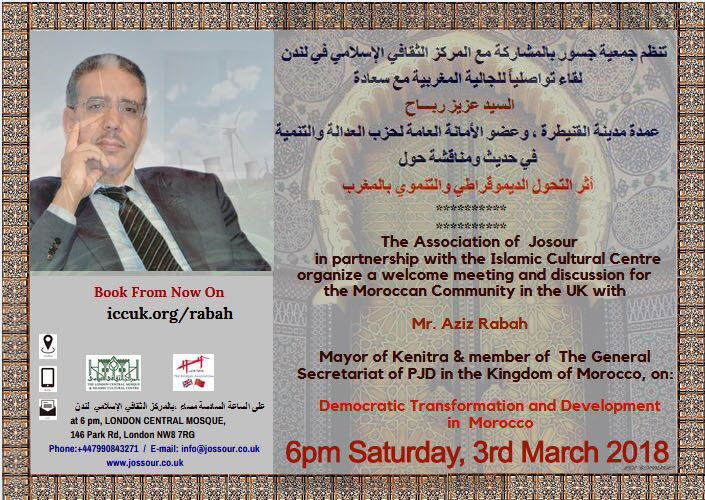 The Association of Josour in partnership with the Islamic Cultural Centre have organised a welcome meeting and discussion for the Moroccan Community in the UK with Mr Aziz Rabaha - Mayor of Kentira & Member of the General Secretariat of PJD in the Kingdom of Morocco. Please note that this is an invitation only event and only has a finite number of seats available. 1 2 ticket/s for this event. If you have reserved more then one seat, please put the name of your guest/s in the notes section below.